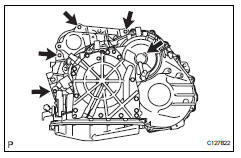 Remove the engine with transaxle (see page em- 98). 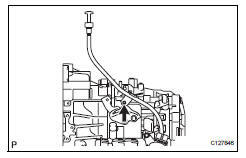 Remove the drain plug and gasket, and drain atf. Install a new gasket and the drain plug. 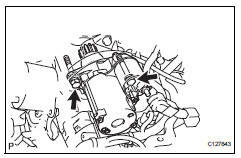 Open the terminal cap, and remove the nut and disconnect the starter wire. 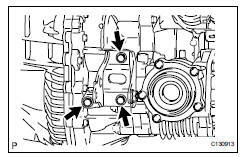 Remove the 2 bolts and starter. Disconnect the transaxle wire connector. 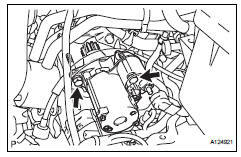 Disconnect the 2 speed sensor connectors. Disconnect the wire harness clamps. 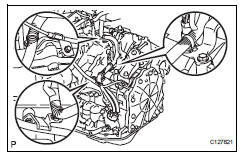 Remove the oil cooler (see page ax-127). 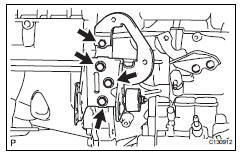 Remove the 3 bolts and mounting bracket. 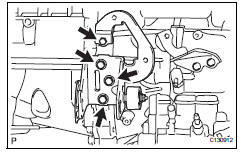 Remove the 4 bolts and mounting bracket. 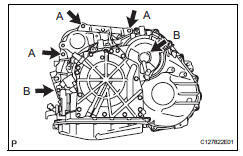 Remove the transfer (see page tf-59). 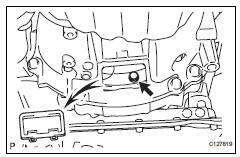 Remove the 4 lower side mounting bolts. 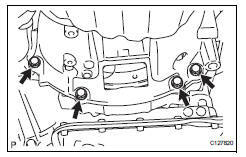 Remove the 5 upper side mounting bolts. Remove the bolt and oil filler tube. Remove the 2 bolts and cable bracket. 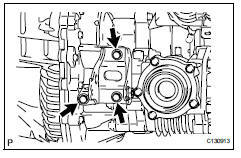 Inspect the torque converter (see page ax-153). 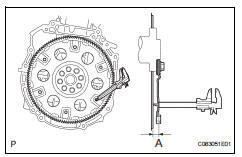 Install the torque converter clutch to the automatic transaxle. 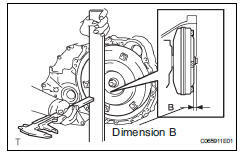 Using a vernier caliper, measure dimension a between the transaxle and the end surface of the drive plate. Using a vernier caliper and straightedge, measure the dimension b shown in the illustration and check that b is greater than a. Install the cable bracket with the 2 bolts. Install the filler tube with the bolt. 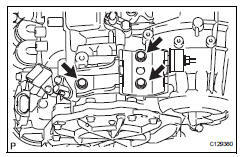 Install the automatic transaxle with the 5 upper side mounting bolts to the engine. 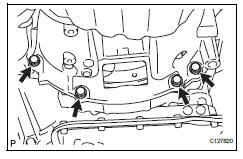 Install the 4 lower side mounting bolts. First install the green colored bolt and then the 5 bolts. Install the transfer (see page tf-75). Install the mounting bracket with the 3 bolts. Install the mounting bracket with the 4 bolts. Install the oil cooler (see page ax-127). Connect the wire harness clamps. 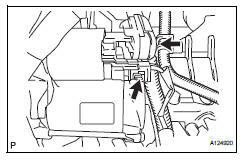 Connect the 2 speed sensor connectors. 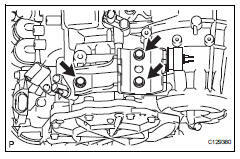 Connect the transaxle wire connector. 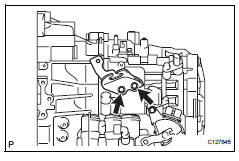 Install the starter with the 2 bolts. Install the terminal nut and cover the nut with the cap. 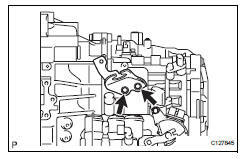 Install the engine with transaxle. (See page em- 105). 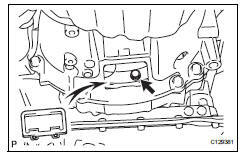 Inspect the automatic transaxle fluid (see page ax- 102). 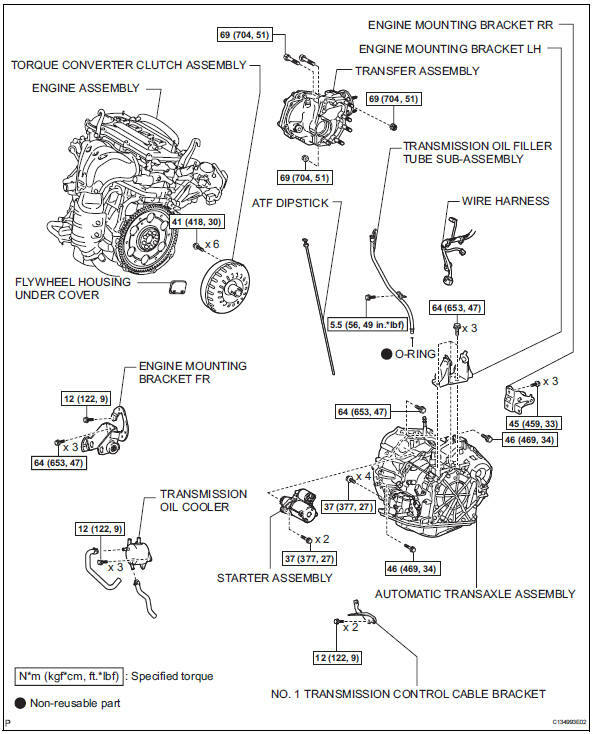 Perform the reset memory procedures (a/t initialization) (see page ax-18).